Yesterday was my first official working day for 2017 . Usually, while setting up, I have an inner dialogue about possible eye and lip colour combinations to use on my model/client for that day. As I started setting up my table at Studio 1 in GMA, I subconsciously laid out my favourite Rose Gold eyeshadows. That’s when it all “clicked”. Cue in Celine Dion’s song, “It’s All Coming Back To Me Now”. For the New Year Holiday, I was reading the January 2017 issue of Allure Magazine when my eye caught a small advert on the upper right hand side of a page I was perusing. It was for Tweezerman; a Rose Gold Love Story Gift Set. A week before this, I acquired my new Iphone 7… in Rose Gold. Everything was coming up Rose Gold in my eyes. 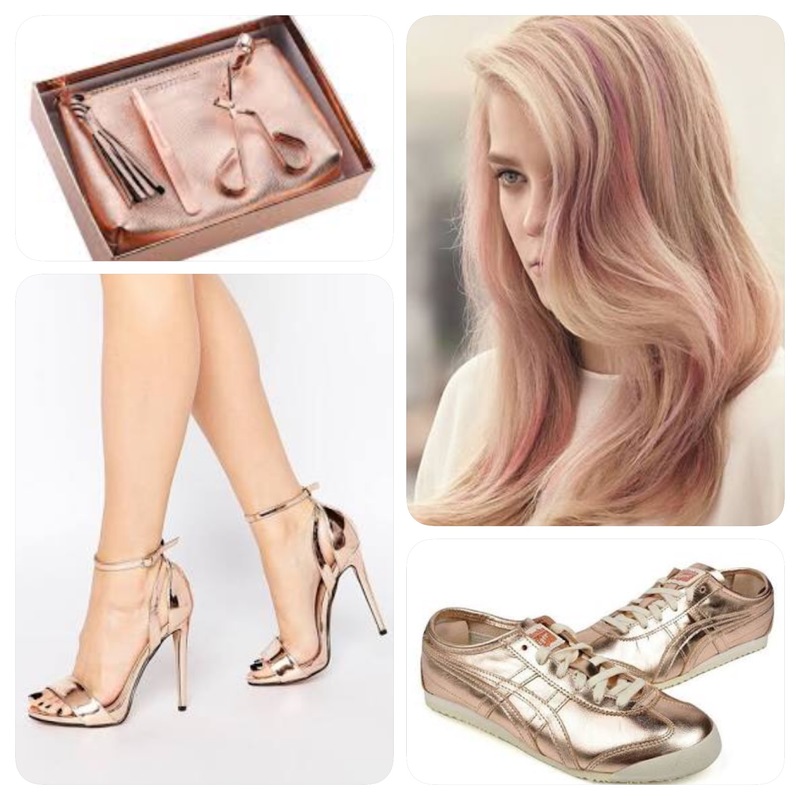 I suddenly remembered that I have seen this colour trend late last year on sneakers, heels, bags … even on hair (I first saw this colour on Kylie Jenner in October 2016; see this post by MTV to see which stars sported the Rose Gold look on their manes). I first encountered this colour circa 2008. It was a metallic cream eyeshadow from Laura Mercier Cosmetics. This was a delicate rose coloured eyeshadow with fine gold flecks became my “go-to” eyeshadow. I used it on many shoots and on all of my brides. Either as a single colour wash or as a base colour. The colour gave off a very feminine appearance. Soft and dreamy. I usually use a small flat synthetic brush to apply this. Your fingers can do the trick as well. The Laura Mercier Caviar Stick Eye Colour was a recent addition (circa 2013). I decided to purchase the Rose Gold version in this product line thinking it would be the same colour as the metallic cream eyeshadow. It is not. It is more gold than pink. The Caviar Stick is relatively easy to use, just run the “stick” along your lids. The pressure of your application can intensify the colour on your lids, so always use soft gentle strokes. I blend this product with my fingers or a synthetic eye shadow brush. In terms of longevity, the caviar stick lasts longer than the metallic creme eyeshadow. 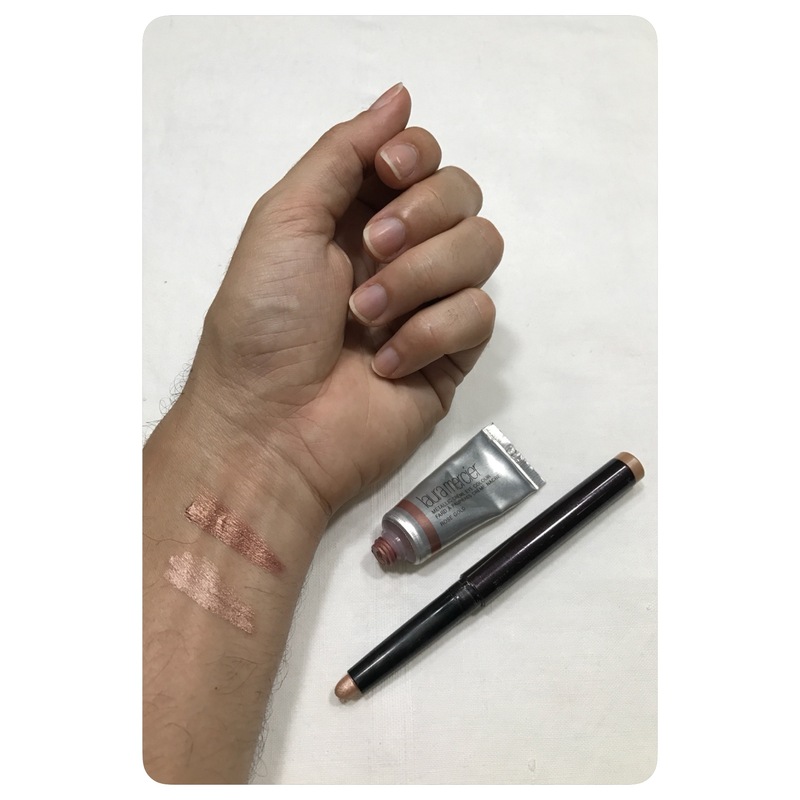 Since it’s very humid here in the Philippines and some women can get quite oily quickly (especially on the eyelids), I enhance the staying power and colour pay off of both products by first applying a generous amount of Nars Smudge Proof Eye Shadow Base (click to read my blog entry about it) on the lids. On this photo feature from my Instagram page, for the sake of comparison, I am wearing the Rose Gold Mettalic Creme Eyeshadow on my right eye (your left) and the Rose Gold Caviar Stick Eye Colour on my left eye (your right). The Laura Mercier Caviar Stick Eye Colour in Rose Gold works very well with Green, Hazel, Blue and Light Brown Eyes. I believe this colour works really well with medium to dark skin tones. If you have very fair/pale skin, I suggest not to use this colour alone because it can make you look “sick”, instead layer together with warm browns/taupes plus add a gold highlight for drama. Rose Gold has been around for quite some time. Thanks to the Iphone, it is now a very popular colour. If you are a girl who loves riding on trends, this eye colour is a good way to match those heels of yours. Ok, fine… it would match your new Iphone. But if you are one of those girls who doesn’t have the care in the world for trends, a girl who prefers to have a “romantic” eye makeup look, then this eye colour is definitely for you. Upon writing this blog entry, I decided to check out http://www.lauramercier.com for a price check. I found disappointment instead. The Mettalic Creme Eyeshadows are no longer in production (BOO!). The Caviar Sticks are still around and they retail for $29 / Php 1350. Visit the Laura Mercier Boudoir in Rustan’s to check out the other 18 shades.